CNP Laboratory | May our skin grow beautiful, as we grow wiser. CNP Laboratory will be releasing a intensive whitening program called the CNP Laboratory Intensive Vitasolution / CNP 인텐시브 비타솔루션. This home management program comes with stabilized and concentrated Vitamin C to brighten the skin , while placenta extracts rejuvenated and nourish aging skin. The product is oil-free and hypoallergenic, therefore suitable for all skin types including oily and/or sensitive skin types. Furthermore, the Vitamin C is nanotechnology for it to be absorbed deeper into the skin, stabilized ( as Vitamin C is highly unstable ) and is 20 to 40 times more effective than Vitamin C intake by pills or food, as only extremely small amount of Vitamin C reaches the skin as they are first used by other functions in the body. 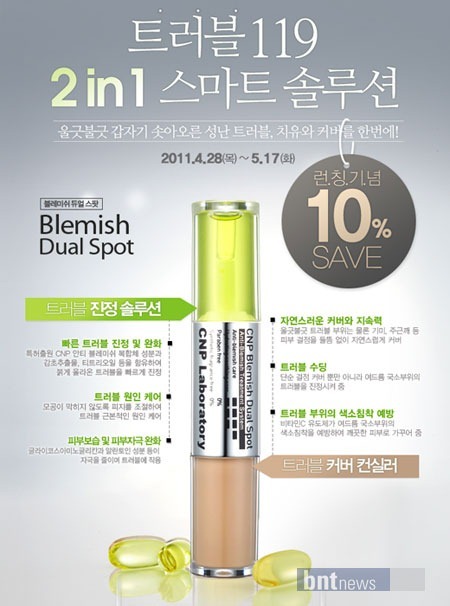 Up-n-Coming skincare brand, CNP Laboratory, has released a new product for the blemish acned skin, called the CNP Blemish Dual Spot. It is a dual product which consist of two compartments – a Spot solution to quickly calm down acne, blemishes and red spots and acts as an antiseptic and a concealer, to cover it up! Paraben, fragrance, and artificial color free – the CNP Dual Blemish Spot features the Anti Blemish Complex which features licorice extracts, tea tree oil to soothe irritation, and control of excess sebum. The product is portable and can be easily brought anywhere you want! It acts in 24 hours to help sooth and calm down your acne spots. They are having a promotion for their launch – a 10% so your best time to try it if you are interested! Search for CNP 블레미쉬 듀얼 스팟 on Gmarket ! Skin79 will be releasing a new cleansing oil called the ‘Smart Clear Deep Cleansing Oil’ and is a 1 step cleansing product which is highly effective. The oil will remove makeup residue instantly as well as black heads and dead skin cells at the same time, while protecting your skin with a blend of different oils – sunflower seeds oil, macadamia seed oil, olive oil – to provide hydration to your skin while cleansing. The other new product will be the ‘Smart Clear Cleansing Gel’ which features Witch Hazel extracts (astringent), aloe vera, chamomile – a cleanser suitable for those with problematic and sensitive skin. 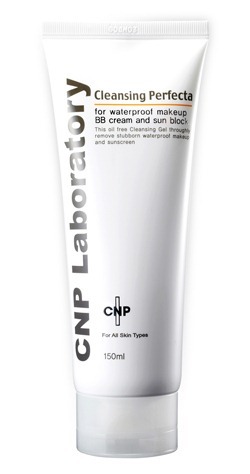 A brand that is quickly rising to popularity is CNP Laboratory which is well-known already for it’s BB Creams and Pore Care products – will be releasing a new cleansing gel called ‘Cleansing Perfecta’ which has already created a buzz due to it’s super cleansing properties. CNP’s Cleansing Perfecta claims to wipe off even the most water-proof makeup such as BB Creams/Foundations/Sunscreen which normal cleansers have a hard time removing. The cleanser can also be used to remove your eye make-up : waterproof mascara, eye shadow etc. CNP has chosen a gel form so that it would be suitable for all skin types. Normally, women would have to rely on a cleansing oil to remove all the stubborn make-up, but oil based cleansers would aggravate those with oily acned skin. The cleanser is also suitable for those with sensitive skin as it contains CNP’s patented ingredient – the Anti Irritant Complex- which contains skin soothing ingredients and herbal extracts to moisturize the skin. The cleanser also has natural papaya extracts which exfoliates the skin at the same time. To purchase it, search for 차앤박화장품 클렌징퍼펙타 on Gmarket. Also released recently is the CNP Laboratory Clean Up make up remover which is a make-up remover for your lips and eyes to clean off your lipstick, water proof mascara, etc. Contains also the Anti – Irritant Complex and skin friendly ingredients such as allantoin and is fragrance-free, preservatives-free and alcohol-free.